Calico Basin is located just west of Las Vegas, on the edge of the Red Rocks National Conservation Area. It is a favorite area for locals for hiking, bouldering, and just to escape from the city. There are a few peaks within striking distance of the busy trailhead, most notably Kraft Mountain and New Peak. I was in Las Vegas for a big tradeshow, and snuck away early to explore Calico Basin. My goal was to summit both Kraft Mountain and New Peak, and possibly another peak if I had time. After a 45 minute drive from the strip, changing clothes, and making my PB&J, I hit the trail around 3:45pm. The parking lot was pretty full, but I had the trail to myself for the most part as I made my way up to the saddle between Kraft and New. Once at the saddle, I expected an obvious way up the busy peak, but that wasn’t the case. With no route clearly visible, I basically just headed up, looking for the path of least resistance through various gullies and rock piles. The routefinding was a lot of fun, and I eventually made it to the crest of the ridge. I initially dropped off the backside a bit, and took a break in the shade to eat my PB&J. But the better choice is to stay on the ridge if possible, occasionally following ledges on the south side of the mountain. From the summit of Kraft I had great views of Las Vegas in the distance, and I could also see the route up my next objective, New Peak. So after a few photos, I started heading down. The routefinding on the descent was equally as fun since I took a slightly different path on the way back to the saddle. The route up New Peak was well worn, easy to follow, and not nearly as interesting as Kraft. But I did enjoy looking at the flowers and other desert plant life along the way. From the summit of New Peak I could see Kraft behind me. In front of me was the interesting looking Red Cap, but the clock was ticking and I wasn’t sure I’d have time for the more challenging scramble to the west of New Peak. I hustled down the ridge, but by the time I go to the saddle between New and Red Cap, the sun was sinking in the sky and it was an easy decision to skip the last peak and start back down to the trailhead via Ash Creek. I’d read that the Ash Creek trail was very cool, and it didn’t disappoint. I followed the trail for a while, and then dropped down into the creek bottom which looked more interesting. This section was definitely an adventure, with an array of rock hopping and sandstone scrambling along the way. It was a ton of fun, and I was glad I was doing it in the daylight. This hike was really fun. Two peaks, and some fun creek bed scrambling made for a nice adventure. Round trip was just over four miles and 1900’ elevation gain in just over three hours. 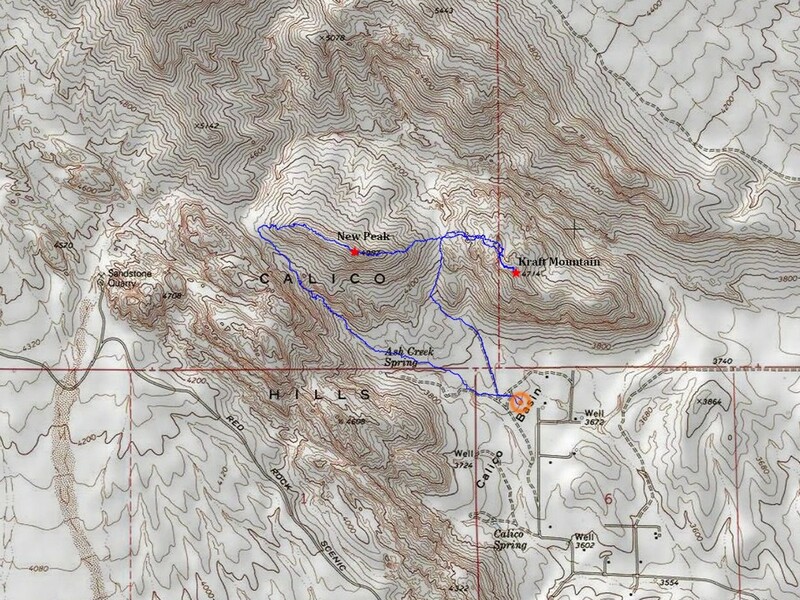 Map of the route, just over 4 miles and 1900' elevation gain. I went counter-clockwise. Kraft Mountain from the Calico Basin trailhead. Trail to the saddle, New Peak in the background. Heading up to the saddle between Kraft and New. West face of Kraft from the saddle. Lots of fun routefinding on the way up Kraft Mountain. New Peak from the summit of Kraft Mountain, Bridge Mountain in the background. Turtlehead and Greycap from Kraft. The trail up the east side of New Peak. Kraft Mountain (reddish) from New Peak, Las Vegas in the background. The trail down Ash Creek was a great adventure. Swiss Cheese rocks in the Ash Creek canyon. Looking down Ash Creek toward Calico Basin. One last view back up Ash Creek. I had to squeeze under this round on the way out.